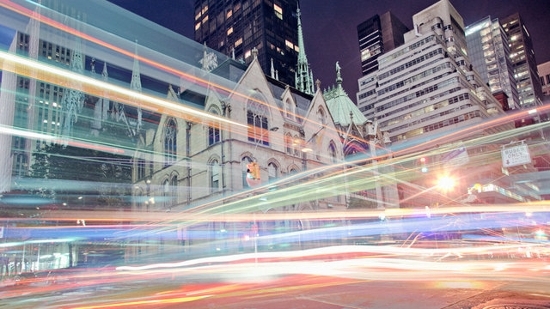 Millions of tweets can have a practical purpose, say the designers of UrbanFlow. Saving lives, improving city quality, and creating a profit are among the benefits we can derive. Building-use data is easily accesible in the social media era. Big data analytical tool from XSEDE16 offers a way to harvest streaming location info. UrbanFlow holds tremendous potential for city planners, social scientists, geographers, and entrepreneurs. Listen closely and you’ll hear the heartbeat of your city. Pay attention to your town and you’ll know its needs before they arise. Do residents need closer access to medical care? Do they need housing to the west or more restaurants up north? Those are a few of the questions answered by UrbanFlow, a new computing platform that harvests a city’s realtime social media traffic to analyze land and building use. Harnessing this dynamic stream is the undertaking of a team led by Kiumars Soltani and advised by Shaowen Wang. Wang is director of the CyberGIS Center for Advanced Digital and Spatial Studies at the University of Illinois at Urbana Champaign (UIUC) and Soltani’s research supervisor. 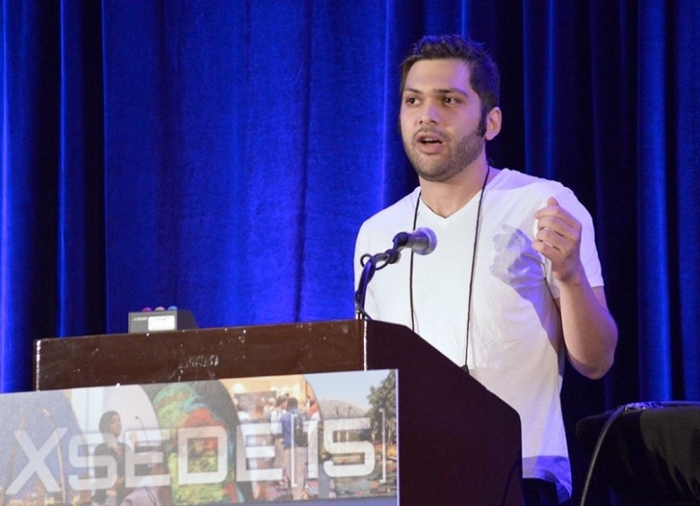 Soltani, a fourth year PhD student at UIUC, demonstrated UrbanFlow at the XSEDE16 conference in Miami. UrbanFlow was born from earlier research by Wang’s group demonstrating that social media can reveal patterns of people movement across multiple geographic scales. Seeing these patterns offers a means for making informed decisions for an urban environment. “We wanted to study human mobility and design a system and networks to see how people move around in an urban setting,” says Soltani. In the face of the rapid urbanization that is expected to continue well through the middle of this century, infrastructures will be established and revised. People, materials, and resources will move around, so how should we match the resources and materials to the needs of the residents? Until now, analyzing and visualizing population movement within a city was a laborious, challenging, data-intensive bit of guesswork. Soltani’s insight was to recognize that, instead of paying survey crews to go out and collect data on the use of each building in a city, we now have millions of users providing this information voluntarily and in real time. To harness all this ambient geographic information, Soltani led the development UrbanFlow. City planners, social scientists, and geographers can use UrbanFlow to synthesize massive geo-located Twitter data with detailed land use maps. To manage the massive and continuous social media datasets, UrbanFlow uses the power of a hybrid HPC environment called ROGER (Resourcing Open Geospatial Education and Research), a flexible architecture particularly suited to the task of resolving geospatial big data. Though Soltani uses the ROGER hybrid supercomputer during the research and development of UrbanFlow, the cloud modality option can provide many users with easy and simultaneous access to the analytical power of UrbanFlow via the CyberGIS Gateway. This is an added benefit, since many cities across the globe lack the land and building use data required to make timely decisions. For those cities, UrbanFlow data sets can function as training data in tandem with local streaming social media data. Soltani’s demonstration at the XSEDE16 conference was limited to three years of Twitter data – about 2.5 billion geo-located tweets. This data is publicly available and users have explicitly expressed their willingness to share their locations. But for those who are concerned about user privacy, Soltani assures users his system does not provide an individual metric and does not reveal whether a person is going from point A to point Z. “We are merely making inferences about city dynamics, land uses, building uses and the purposes of infrastructure. We are actually not making inferences about individuals,” says Wang. People will be affected by the decisions inferred from UrbanFlow – but that’s the point. A city evolves over time, and seeing the patterns of movement enables insights that can save lives, improve living standards, and generate profitability. But what if there was a way to see these shifts coming, and for cities to be prepared instead of getting hammered? “This is unprecedented – the first time ever to have a heartbeat understanding of the city dynamic based upon people’s locations and their movement,” says Wang. Other UrbanFlow team members include senior research scientist Anand Padmanabhan and postdoctoral research associate Aiman Soliman at the CyberGIS Center. The research and development of UrbanFlow is supported in part by the US National Science Foundation (NSF) under grant numbers: 1047916 and 1443080. Computational work used the ROGER supercomputer, which is supported by NSF under grant number: 1429699. Any opinions, findings, and conclusions or recommendations expressed in this material are those of the author(s) and do not necessarily reflect the views of NSF.